As we are sure you know by now (if you don’t, where have you been? 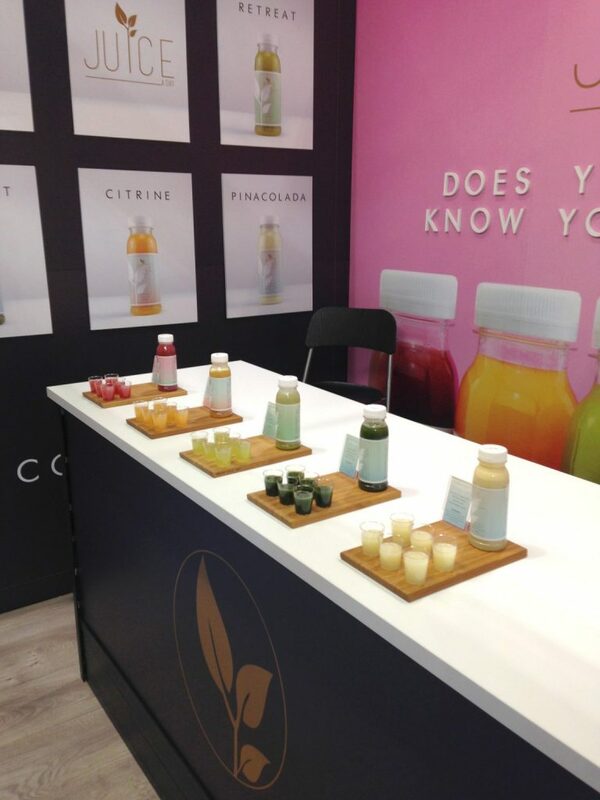 ), CuCo love being a part of ALL things creative so we were delighted when Juice A Day approached us with a creative challenge for their brand-new business – to design and produce a bespoke exhibition stand to launch their brand at London ExCeL’s International Food Exhibition. Juice A Day are a new juice brand with a difference who offer drinkable ‘goodness’ that is ‘pressed and bottled to impress.’ They focus on producing an elevated health experience with their range of five fruit and veg juice drinks including the unique flavours Meloberry, Pina Colada, Retreat, Verdant and Citrine – all boasting a unique blend of fresh ingredients that contain absolutely no artificial fillers. Juice A Day’s range is ‘made with a new attitude in consuming cold pressed drinks’ and strives to change consumers perception of typical health juices and instead focuses on bringing balance to your wellbeing. Whether you’re after a refreshing boost or a cheeky mixer – Juice A Day are sure to have a juice suitable to your taste buds! With their Ibiza-esque branding, Juice A Day really is the latest must-have accessory for fashionable individuals. AND, they are seriously yummy! CuCo dove straight into the project with ideas flying off the walls. After many mock-ups and a white board full of sketches, the design team developed a final vision that Juice A Day loved. Complete with a blown up logo, backlit 3D lettering, raised menu boards, a sample bar, large product graphics and key lifestyle photography, the stand expressed a clean and minimalistic yet bright, colourful, and exciting atmosphere that many attendees at ExCeL commented ‘stood out from their neighbours’. Are you getting ready to launch or exhibit your brand at a large show like this one? Give CuCo a call today on 01202 911959 or email us at hello@cucocreative.co.uk. We’d love to hear from you!